The Model 25 is designed on the Model 20, adding on the additional benefits of Paxman's unique dual bore system. 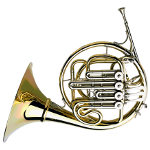 Central to this design is the Merewether System, whereby the airflow travels in the same direction on both the F and Bb horns, minimising interruption from the turning rotor. The Model 25 incorporates Paxman’s unique dual bore system a larger cylindrical bore on the F side opens it out, giving a similar level of resistance to the Bb side. The F and Bb sides of our full double horns are well-matched, and all models feature exclusive tuning slides for each side. Apart from the obvious benefits, the Bb tuning slide allows the player to add an extension with a manually operated A= valve. The mouthpipe main slide also helps to drain the instrument. The thumb valve is easily reversible to stand in either F or Bb. 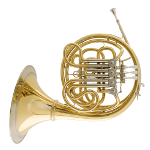 The model 25 is offered in any combination of four bores and three different alloys of brass.